Although captain of the royal knights, Goofy is quite the pacifist. Nevertheless, he is as reliable as he is loyal, smarter and wiser than he seems. Goofy was taking a nap in the castle gardens when Donald frantically woke him up to tell him about the King's disappearance. No one else was to know about this, but Queen Minnie and Daisy found out right away. King Mickey left instructions in a letter, ordering Goofy and Donald to find a "key" that will save them from the approaching darkness and to find a man named Leon who will be their guide. Together with Pluto and Jiminy Cricket, Goofy and Donald traveled to Traverse Town to begin their quest. During their search, they met a young woman named Aerith who happened to be a friend of Leon's. She apparently also knew about the King and informed the two of the recent events that have been happening in the different worlds regarding the Heartless, the Keyblade, and a man named Ansem, and how they were connected to the King's disappearance. However, Heartless suddenly appeared just as they were about meet up with Leon. Goofy and Donald fought the Heartless until they reached the Third District, but an explosion sent them flying and they fell on top of Sora. Seeing the Keyblade in the boy's hands, they quickly realized that they had found the "key" they were searching for, but dealing with the Guard Armor came first. After defeating the Heartless, the three made their introductions and Goofy and Donald explained their quest and invite Sora to join them in their travels to find the King and Sora's friends, Riku and Kairi. Sora was reluctant at first, but eventually cheered up and agreed. The three encountered many friends and foes alike during their adventures to various worlds, along with several hardships that served to strengthen and deepen their bonds. Their friendship faced the most difficult test when the group arrived at Hollow Bastion, Leon's home world. They found Riku who suddenly revealed himself to be the "true" Keyblade master, and to their surprise, the Keyblade left Sora and came into Riku's possession. Goofy and Donald were forced to leave Sora to follow the Keyblade. However, Sora did not give up and managed to catch up with them and Riku. His old friend attempted to eliminate Sora, but Goofy blocked the attack just in time, declaring that he simply could not betray Sora even though it meant going against the King's orders. Finding new strength in their faithfulness as friends, Sora regained the right to hold the Keyblade. The three confronted Maleficent and Riku, who was eventually possessed by Ansem. In order to save Kairi's heart that was residing in his body, Sora stabbed himself with Riku's dark "Keyblade" and turned into a Heartless. Goofy and Donald had no time to grieve and escaped with Kairi, although Goofy was still concerned about the Final Keyhole. Before they could leave the castle, a group of Heartless appeared and blocked their path. However, one peculiar Heartless appeared - Kairi realized it was Sora and with her help he was able to regain his original form. Goofy and Donald were overjoyed and they were able to reach their ship safely. The group returned to Traverse Town for a short while, but Sora, Goofy, and Donald knew they had to return and close the last Keyhole. The three find themselves in the End of the World where the final battle with Ansem took place. They were victorious, but Ansem would not surrender until he opened the door to the Realm of Darkness where Kingdom Hearts resides. He met his demise when Sora was proven right - that Kingdom Hearts was light. However, the Heartless threatened to invade the Realm of Light and the three of them were not enough to close the doors. At that moment, the King appeared wielding the Keyblade of the Realm of Darkness. Together, with Riku, Goofy, and Donald, the King and Sora used the two Keyblades to lock the doors on both sides. Before the doors closed, the King promised that they would meet each other again soon. Goofy constitutes a third of the trio of friends that travels the cosmos in search of the King, made up of Sora, Donald and Goofy. He is the Captain of the Royal Knights back in his homeland of Disney Castle, where he resides with King Mickey, Queen Minnie, Royal Court Magician Donald and the other various inhabitants of the kingdom, including Gummi Ship engineers Chip and Dale. Despite his honorary title, Goofy is as soft to the bone as a candy bar, always cheerful and giving his friends the support they need with his signature laugh, "Ahyuck!" However, despite his calm nature and his desire to avoid confrontation, this Knight is loyal to the end and aids his friends in battle, whirring and smashing Heartless and evildoers out of the way with his signature shield. Having teamed up with Sora in his originaly journey, Goofy follows the Keyblade bearer to continue with his search for the missing King, who has been locked inside the realm of darkness due to events that transpired after fighting Xehanort's Heartless; and as Sora is approached by a mysterious hooded figure, Goofy follows him all the way to Castle Oblivion, a citadel which eats old memories and creates new ones. Once inside, the Knight admits that he has a feeling that the King is lurking around somewhere, thus cementing his decision to stick by Sora as the boy travels through the worlds in search of ‘someone they know', a clue given by the mysterious hooded figure who grants them cards which allow access to realms they have already visited but cannot remember. As they progress through the worlds and the castle, Goofy and Donald become increasingly worried with Sora's obsession with a girl named Naminé, who is apparently the ‘someone they know', though they can't remember if this is true or not. When they finally confront Sora about it, he shuns them and continues on his own - or so he thinks; later on, just as Sora is about to be defeated by the evil Organization XIII member Larxene, they jump in and save the boy's skin from a nasty shock - literally. Now back together, the trio continues onto the thirteenth and final floor where they come face-to-face with the elusive castle lord himself, Organization XIII's number XI, Marluxia - who is incidentally the mysteriously hooded man who led them to the castle in the first place. When Marluxia threatens to use Naminé to destroy Sora's memories - since she is the one responsible for the lost memories - Goofy and Donald quickly back their friend up and together they take Marluxia down. Unfortunately, Naminé must still put them in special pods for a year of sleep while she restores their memories of the time before Castle Oblivion, spelling the destruction of the memories they have gained within the fort. Though Goofy is sad to forget Naminé, he knows that she is merely forgotten and never lost, and so he goes to sleep for a year with Sora and Donald, to be awoken for a brand new adventure. Captain of the royal guard of Disney Castle, and one of the King's closest, most trusted allies. Despite his role, Goofy wields a shield, being a kind hearted pacifist. When the King set out on a Journey, it was Goofy whom he entrusted with the task of finding the Keyblade in the Realm of Light, and to act as guardian and ally to its Wielder. Together with Donald, Goofy succeeded in his mission, even though following his beliefs and remaining loyal to Donald and Sora required he broke the King's own orders. He spent a year sleeping after the great battle when a conspiracy set by Organization XIII ravaged the trio's Memories, and sleeping was the only way to restore them. 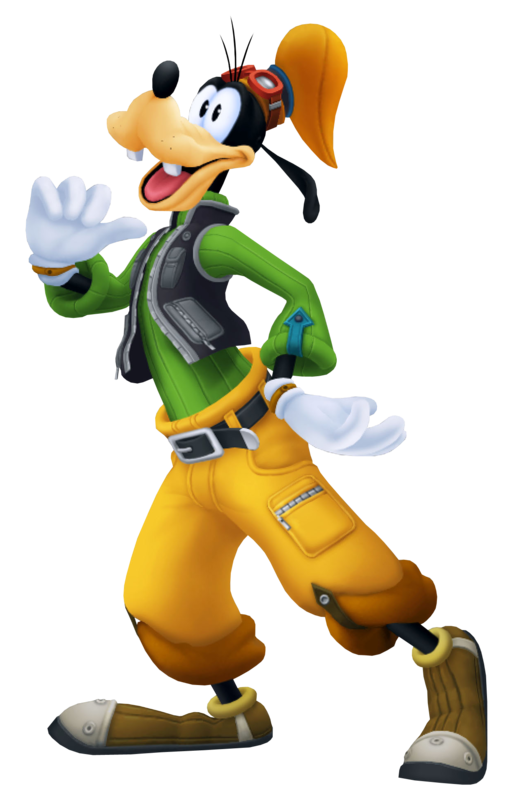 Upon waking, Goofy is ever joyous to be reunited with his friends, and without hesitation Goofy is ready to set out on another journey to find the King and Sora's friend, Riku, who were lost during the battles before. Never once losing sight of that mission, Goofy insists still on helping whoever needs his assistance, be they old or new friends. His loyalty is put to the test once more during the great battles for Hollow Bastion. With both Maleficent and Organization XIII sending wave after wave of Heartless and Nobodies to attack the town, the trio is intent on helping their friends, yet Mickey stands in their way - they are to search for Riku and Kairi, not waste time there. As before, Goofy looks inside his Heart and reaches his own decision - he rather face Mickey's disapproval than stare at Sora's heartbroken expression any more. He is made to pay for his act of treason when a large piece of debris comes flying towards Mickey, and Goofy takes the blow in his stead. Thought to be dead, Goofy lies motionless for a good while, only to come to his senses shortly afterward. He catches up with the gang soon enough, and after a brief reunion, they finish what someone else started, and save Hollow Bastion. The end result however is that Mickey goes missing again. With the Organization held at bay thanks to the group's efforts, and with one more friend to look for again, the trio leaves Hollow Bastion and continues their journey. Eventually Goofy makes it to the Organization's stronghold where everyone the trio searched for are. Together with Donald and Sora, Goofy fights the Organization and defeats them only to end up on Destiny Islands along with the rest of his friends who finally made it back to the Realm of Light. With the universe seemingly at peace, Goofy bade Sora farewell and finally went back home, this time for good… hopefully. The pacifistic captain of Disney Castle's Royal Guard, still leaves his mark in battle in spite of his state of memory-restorative stasis during the time of 358/2 Days. Skilled in use of his Knight's Shield, Goofy (figuratively) boasts unparalleled defensive ability, able to withstand even the most brutal onslaughts. 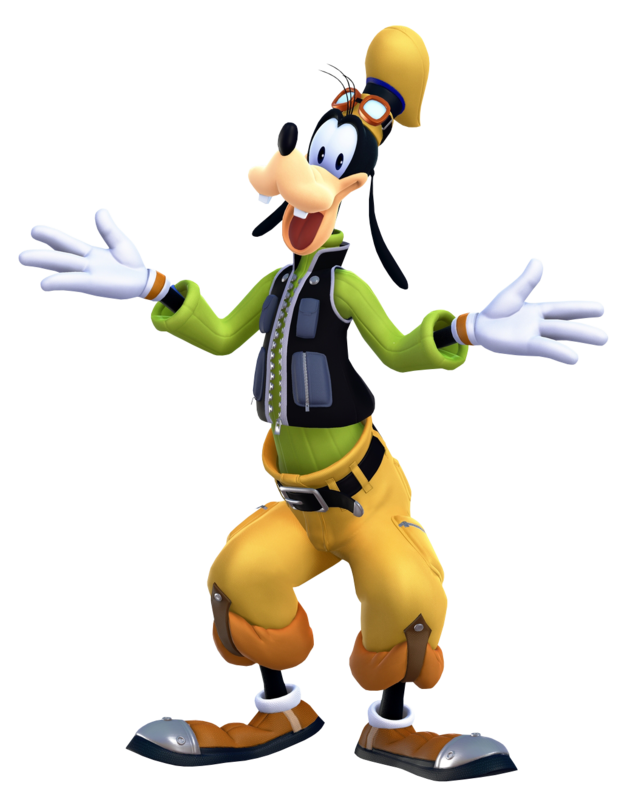 While his magical ability is lacking at best, Goofy has little need of it, as his hardy strength suits him much better; with somewhat awkward spins, he clobbers away Heartless to surprising effects. Goofy's Limit Break, Knocksmash, transforms the knight into a living missle, whizzing in wild, looped paths to smash down enemies with his shield. 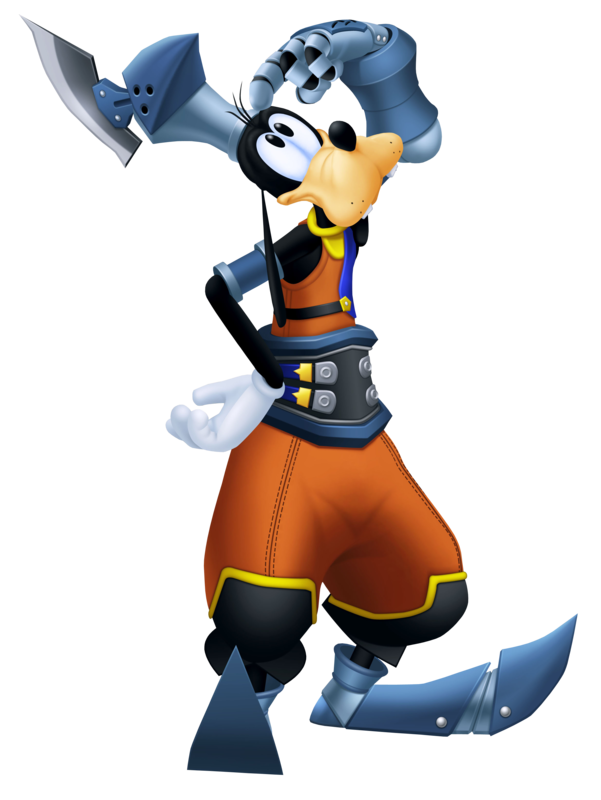 The clumsy and optimist captain of Mickey's royal knights, Goofy - like Donald - spends his time in Birth by Sleep in the Mysterious Tower in the company of Yen Sid. He sits by Donald's side as they deplore the departure of Mickey, however his sadness is lifted when Ven arrives with the King's Star Shard. Goofy introduces Ven to Yen Sid and tells the latter about the Star Shard, which the wizard uses to discern Mickey's status. Goofy excitedly declares that he and Donald will save the King, but Ven goes in their stead when Yen Sid says that the duo might not be sufficient. Some time later, Goofy rushes to the King's aid when Aqua arrives with him, taking care of him with Donald as Aqua learns the news of Eraqus' death and those that committed the act. Following Aqua's departure and the conclusion of her final encounter against friends and enemies, Goofy is present when Mickey gives back the tools he obtained from Yen Sid, feeling he failed in his mission and is unworthy of them. Both Goofy and Donald are ecstatic when Yen Sid decides to give Mickey back his Keyblade. Disney Castle's Captain of the Royal Knights, Goofy is simple minded, clumsy and a pacifist despite his position, prefering to fight with a simple shield. As the glue that holds Sora and Donald together, he is amazingly optimistic and has more common sense than he is given credit for. He has saved the universe twice alongside Sora and Donald, and looks forward to a quiet reprieve back home. Unfortunately, the peace is shattered with the revelation of the Journal's unsolved secrets. Brought into and trapped in the digital world, Goofy finds sanctuary in the digital Library while Data Sora debugs the Journal, but willingly steps into the action once a helpless Sora defies orders to finish what he started despite lacking a weapon. He has a steadfast loyalty to Data Sora despite him being data, and is confident that his friend is more than a digitized replica due to their connection. Disney Castle's very own Captain of the Guard, Goofy is, well, goofy. He's a bit of a clutz and not always the sharpest tool in the shed, but he's loyal and caring above anything else! With his trusty shield in hand, Goofy will always be there to keep the enemies at bay; perhaps his reputation and success rate would explain why he has time to leave his post and sneak off for a nap in the lazy afternoon. Goofy and Donald had once again, departed their lovely home in order to accompany King Mickey to Mysterious Tower to support during Sora and Riku's Mark of Mastery exam. Even with those years fighting Heartless and Nobodies alongside his young Keyblade-wielding friend, he can't help but feel worried and agitated as they leap headfirst into the mysteries that await them in the Sleeping Worlds. He longs to be by his side, watching over him, but he understands that this is an ordeal Sora and Riku must both face on their own. Regardless, the warrior within him itches to pick up his shield once again. Unfortunately, when he did receive that chance, it was not one that he had expected. Maleficent and Pete had taken advantage of their absence from the castle and stormed in, successfully managing to capture Queen Minnie and take control of the castle. They sent Diablo to Mysterious Tower with a short message: return to the castle or danger would befall their beloved queen. Thus Goofy found himself with his shield drawn, facing the evil fairy and the former captain of the proudest steamboat on the river, forced to listen to her demands for Jiminy's digitized journal which, once in her possession, may somehow grant her the power to take control of all worlds. It was painful to watch, as well as to listen to, and they were almost done for until Lea showed up out of nowhere to not only free Minnie from Pete's clutches, but also turn the tide of battle. They were safe, for now. The three of them returned to the Mysterious Tower with Lea who, if they were to save Sora and Riku from Xehanort, they would needs his help. Goofy watched desperately as both Mickey and Lea departed to play their parts to help the cause, wanting so greatly to aid them in their struggles. In accordance with the King's wishes, he and Donald sadly stayed behind, knowing that if something went wrong, they would be the only ones left to protect the Realm of Light. Even with that possibility, they used Yen Sid's Star Shard, the very same his round-eared apprentice had used all those years ago, to enter the Sleeping Worlds and rescue their king and Riku from Xehanort's clutches. Once again, they were saved at the nick of time. With the 12 seekers of darkness departing the scene, they were able to return to the tower. Sora was unable to wake from his seemingly endless dream, trapped in the deepest abyss. Goofy looked on sadly, almost expecting for his friend to just yawn and stretch his arms out wide, grinning that signature smile of his at them like nothing was wrong. He accepted that the only person who could wake him up would be Riku, and entrusted him with this important task. As expected, Riku was able to return with Sora safe and sound, and the party was able to enjoy a quaint little tea party with the danger now past. The Captain of the Guard entrusted by King Mickey to find the 'Key' alongside the Court Magician, Donald Duck. After helping save Sora from the clutches of Xehanort, he waits in Yen Sid's Tower for his friend to return from the Sleeping Worlds. With Sora's eventual return to the Tower, it is revealed by Yen Sid that Xehanort's attempt to take over Sora's body drained all of his strength. It is now up to Goofy and his friends to return to Olympus Coliseum in order for Sora to regain his strength. The Captain of the Guard of Disney Castle. He, along with Donald Duck, was tasked by King Mickey to find a "key" and save the worlds. After not being able to join Sora on his journey into the Sleeping World, he is now back by Sora's side as they attempt to stop the True Organization XIII from succeeding with their plan to create a realm where Light and Darkness exist in equilibrium.